Ask anybody what the top three priorities in business are today and you’re likely to hear, “Security, security, and security.” That was the message RapidFire Tools’ Mark Winter delivered during his presentation at the ASCII Success Summit — Columbus held May 17 to 18 at the Sheraton Columbus Hotel at Capitol Square. Winter began his presentation noting there is a huge need for security in the small- and medium-sized (SMB) market, adding despite headlines surrounding attacks on Target, Home Depot, and Sony Pictures more than 80 percent of attacks target small merchants. “This shouldn’t be a surprise,” says Winter, adding the average cost of an attack an on SMB jumped from $8,699 on 2013 to $36,000 last year. Winter says, “In all, internal vulnerabilities in some form or another are responsible for a total of 70 percent of all data breaches.” Additionally, Winter says 52 percent of security breaches are a result of human error. The top human error source? End user failure to follow policies and procedures (47 percent; followed by general carelessness (42 percent). Winter concluded, saying MSPs need to live in the detect stage to provide value and best protect clients. 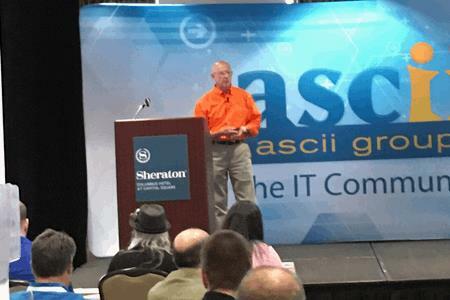 The ASCII Success Summit — Columbus is being held May 17 to 18 at the Sheraton Columbus Hotel at Capitol Square. It is one of nine solution provider-focused conferences ASCII is hosting in North America in 2017. For more information on ASCII, go to www.BSMinfo.com/go/InsideASCII.